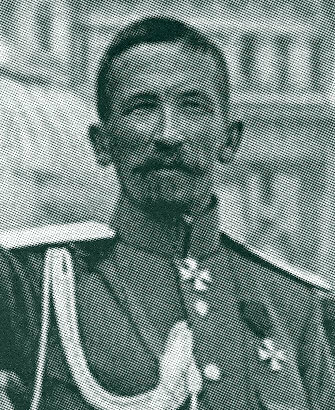 The First Army of the Russian Socialist Republic, after remaining inactive and mutinous for several months during the spring of 1917, was transformed under the spell of Kerensky's eloquence and in late June was ready to launch a new offensive. Before Kerensky's accession to power, the death penalty for treason, desertion and mutiny had been abolished and the Russian soldiers were left free to choose their own officers, depose them, obey or disobey them, kill them if necessary. All sense of discipline seemed to have left the Army, even before Kerensky became Premier. After forcing the Government to restore the death penalty for treason and mutiny, Kerensky toured the several battlefronts, exhorting the soldiers to obey their officers and prepare for a new offensive against the Teutonic enemies. At last the revolutionary committees in each army consented to participate in a new offensive. Kerensky thereupon ordered the generals to launch a modest offensive against the Austrians in Galicia. General Brusiloff was now in supreme command of the Russian forces, and the principal leaders of army groups were: General Kornilov, General Erdelli, General Gutor, General Tcheremisoff and Prince Gargarin. The disposition of the Austro-Hungarian and German forces remained unchanged, with Prince Leopold in command of the Baltic Armies, Archduke Joseph Ferdinand defending the Hungarian frontier and General Mackensen, with his group of armies, covering the extended Romanian frontier. On June 29, 1917, with Lemberg as his main objective, General Brusiloff's Seventh Army began the bombardment of a 20-mile sector of the Austrian line opposite Brzezany. The Russian Infantry attacked the line on July 1, 1917, seizing three Austrian positions before nightfall with 18,000 prisoners, and forcing the passage of the Zlota Lipa the following day. General Kornilov’s Eighth Russian Army breached the Austrian line along the Bistritza River July 7, 1917, pursuing von Tersztyansky's Hungarian forces eight miles and taking 7,000 prisoners. The armies of Brusiloff and Kornilov, in a converging movement, surrounded and captured the important railroad center at Halicz on July 9, 1917. 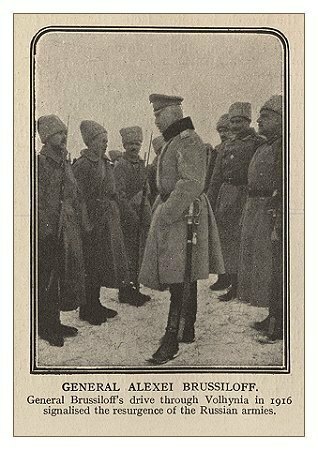 Two days later, General Kornilov's army drove the Austrians out of Kalucz. The town was retaken by the Austrians, but was finally seized and held by the Russians. During the entire engagement, house- to-house fighting was the rule, the bayonet being preferably employed by both armies. In two weeks of fighting the Russians not only captured two important strongholds; they forced the Austrians to retreat into Southeastern Galicia, capturing 36,643 prisoners, besides 125 heavy guns. The Russian advance was finally stopped by the floods. On July 16th, General Kornilov was forced to evacuate Kalusz and retire to the right bank of the Lomnica River. At The moment when victory seemed within the grasp of the Russian Republic, treachery broke out in the Russian Army. The forces of General Erdelli, occupying the sector between Brody and Zborrow, were engaged with the Austrians north of the Tarnopol-Lemberg Railway. During a counterattack by the Austrians, south of Brody, on July 19, 1917, the Bolshevist soldiers mutinied, in obedience to orders from Soviet committees, flatly refusing to support the attacked divisions. Without warning the 607th Russian Regiment basely abandoned its position in the battle line. The disaffection quickly spread and in a short time most of the soldiers along the sector had deserted. Through the gap created by their withdrawal, the Austro-Hungarian Army began to pour. Panic seized the rest of the line. All efforts of the commanders to recall the mutinous soldiers to a sense of their duty were wasted. The loyal remnant of Erdelli's army was forced to break and run, losing all the ground that had been gained in a brilliant campaign of two weeks. The flight of Erdelli's army compelled the rapid retirement of the forces under Brusiloff and Kornilov. Tarnopol was evacuated July 20, 1917 and within a week all the terrain seized by the Russians during 1916 was relinquished. The Austro-Hungarians struck furiously at the flank of the retreating armies, inflicting heavy losses and taking many prisoners. In the North, however, the Russian line held firm and several German positions were penetrated to a depth of two miles. Premier Kerensky had hastened to the Galician front at the first intimation of Bolshevik treachery, but even his appeals could not rouse the soldiers to a sense of duty. The Russian Army was steadily driven back and out of Galicia. While the treacherous Socialists were deserting the colors by whole battalions and even by regiments, a company of loyal women was formed to fight Russia's battles, taking the name, "The Battalion of Death." It numbered 300 women, mostly between the ages of 18 and 25 years. These warrior women wore their hair short or else shaved clean like a monk's poll. Under the instruction of a sergeant of the Volynsky Regiment, they had quickly acquired an exaggerated goose-step. They distinguished themselves in the field, setting an example of loyalty and courage to the mutinous deserters.